Türkiye’de 2002 yılında 76 olan üniversite sayısı 2015’te 193’e, üniversite öğrencisi sayısı ise 1,8 milyondan, 6 milyona yükselmiştir. Aynı dönemde 20 milyon düzeyinde olan sinema izleyicisi sayısının da 60 milyonu aştığı gözlemlenmiştir. İlgili yazında sinemaya gitme eğiliminin birçok belirleyicisi araştırılsa da üniversite öğrenci sayısındaki değişimin etkisi özel incelenmemiştir. Bu çalışmada üniversite öğrencisi sayısındaki hızlı artışın, gerçekleşen sinema izleyicisi sayısındaki artışın açıklanmasında anlamlı olup olmadığı ampirik olarak incelenmiş, pozitif bir etkisi olduğu gösterilmiştir. While the number of universities in Turkey has increased from 76 in 2002 to 193 in 2015, the number of university students has increased from 1.8 million to 6 million. During the same period, the annual number of movie theater audience has reached to 60 million from 20 million. In the related literature, although various determinants of the tendency of going to movie theater has been elaborated, the effect of the change in the number of university students has not been examined yet. This paper empirically investigated the boom in the number of university students and show that it has a positive effect on the movie sector expansion. Arellano, M., & Bond, S. 1991. Some tests of speciﬁcation for panel data: Monte Carlo evidence and an application to employment equations. Review of Economic Studies, 58(2): 277–297. Arellano, M., & Bover, O. 1995. Another look at the instrumental variable estimation of error-components models. Journal of Econometrics, 68(1): 29–51. Austin B.A. 1985. Loneliness and use of six mass media among college students. Psychological Reports, 56(1): 323-327. Blundell, R., & Bond, S. 1998. Initial conditions and moment restrictions in dynamic panel data models. Journal of Econometrics, 87(1): 115–143. Calderwood, C., Ackerman, P.L., & Conklin, E.M. 2014. What else do college students “do” while studying? An investigation of multitasking. Computers & Education, 75: 19-29. Craig, C.S, Greene, W.H., & Versaci A. 2015. E-word of mouth: early predictor of audience engagement. Journal of Advertising Research, 55(1): 62-72. Dardis, R., Soberon-Ferrer, H., & Patro, D. 1994. Analysis of leisure expenditures in the United States. Journal of Leisure Research, 26(4): 309-321. Duan, W., Gu, B., & Whinston, A.B. 2008. The dynamics of online word-of-mouth and product sales—An empirical investigation of the movie industry. Journal of Retailing, 84(2): 233-242. Epstein E.J. 1998 Multiplexities. The New Yorker, Jul(13): 110–113. Faber, R.J. & O'guinn, T.C. 1984. Effect of media advertising and other sources on movie selection. Journalism Quarterly, 61(2): 371-377. Gülçubuk, A. 2013. Salihli'de Açılan AVM'lerin Şehir Yaşamına ve Şehir Merkezindeki Perakendecilere Etkisi Üzerine Bir Araştırma. Celal Bayar Üniversitesi Sosyal Bilimler Dergisi, 11(3): 439-450. Holtz-Eakin, D., Newey, W., & Rosen, H. 1998. Estimating vector autoregressions with panel data. Econometrica, 56(6): 1371–1395. Roodman. D. 2009. How to do xtabond2: An introduction to diﬀerence and system GMM in Stata. The Stata Journal, 9(1): 86–136. Srinivas L. 2002. The active audience: spectatorship, social relations and the experience of cinema in India. Media, Culture & Society, 24(2): 155-73. Tekeoğlu, T., & Nurdan, A. 2016. Türk filmlerinde yaşanan pazarlama sorunları ile ilgili araştırma. İstanbul Ticaret Üniversitesi Sosyal Bilimler Dergisi, 15(29): 349-370. Tüzen, Z., & Yurtseven, C. 2016. The Transformation of the Higher Education System in Turkey after 2002: A Game Theoretic Analysis” Theoretical Economics Letters, 19(6): 97-105. ISNAD Köksal, Emin , YURTSEVEN, ÇAĞLAR . "TÜRKİYE’DE ÜNİVERSİTE ÖĞRENCİSİ SAYISINDAKİ ARTIŞININ SİNEMA SEKTÖRÜNÜN BÜYÜMESİ ÜZERİNDEKİ ETKİSİ". 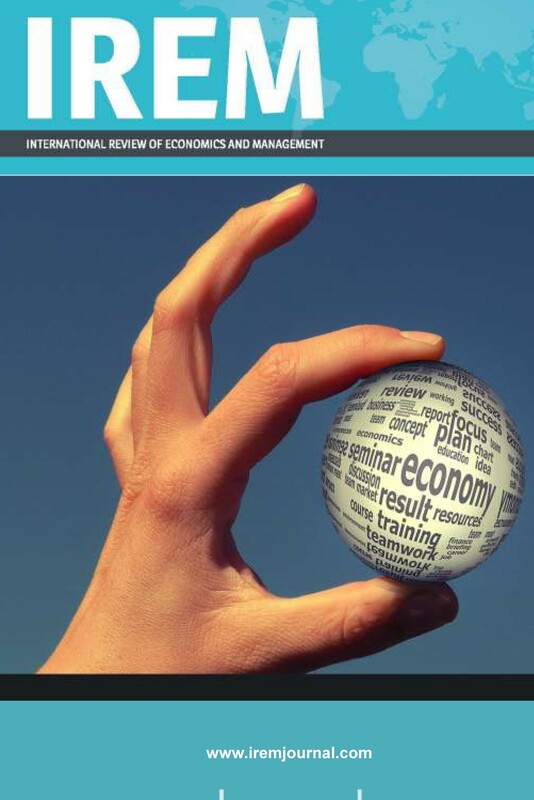 International Review of Economics and Management 6 / 2 (January 2019): 103-116.